Although the Start Server at Powerup option was selected in LMTOOLS, the FLEX service did not start automatically when you rebooted the license server. However, you were able to start the service manually. In the Windows Event Viewer, there was an error message similar to the one below. FLEXlm service failed to start. Cannot find the network path. 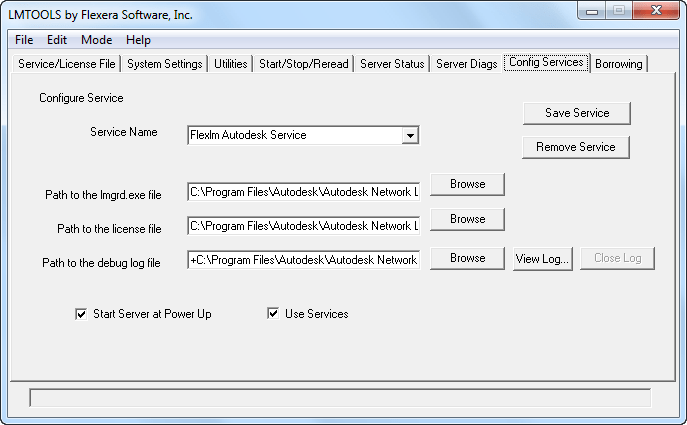 This error will occur if you use UNC paths when you configure the service in LMTOOLS. In most Windows networks, proper credentials are required to access UNC paths and these credentials are usually not available before a user logs in to the machine. Because the FLEXlmservice tries to start before a user logs in, the UNC paths will not be resolved correctly. As a result, the FLEXlm service will not be started automatically when the license server is rebooted. For this reason, it is strongly recommended that you use only valid, local drive letter paths when you configure the FLEXlm/FlexNet service in LMTOOLS. It is possible to configure the service to recognize UNC paths by elevating the rights of the service, but this is not recommended.